I'm learning this new thing called dinner for one. It's an interesting way of cooking. Sometimes it's worthwhile or necessary to make more than one portion of something, which is great when it reheats well and I want to eat it for lunch or dinner the next day. But sometimes one portion is exactly enough. I had a batch of risotto that I made (adapted from the book Le French Oven, which I highly recommend) and I didn't mind having leftovers ... but then I started thinking about arancini. They're fried balls of risotto, usually stuffed with cheese. A local restaurant stuffs them with chili. I had the leftover risotto and started looking at arancini recipes and finally decided I didn't want to deal with the fuss of making balls and stuffing them. The risotto I made had a lot of cheese in it to begin with. And I didn't have anything else on hand that I thought would be good for stuffing. AND! The risotto had slices of mushrooms in it. Trying to work around those to make balls didn't sound like it would be fun. Another good reason for not making traditional arancini was that I didn't want to make a big batch of them. I wanted just enough for one meal, and I figured that a flat patty would be easier to fry than a few round balls. In the end, it was a good idea, and I'll probably do this again. If I really wanted to stuff an arancini, I'd make a round ball. But otherwise, I might just do patties. That's a salad plate - it's not a giant patty! Form the chilled risotto into a patty. Coat with bread crumbs. I used panko, but I'm sure that regular bread crumbs would be just fine. Add enough oil to a small saute pan so it's about 1/8 inch deep covering the bottom of the pan. A little more or less oil is fine, you just want to make sure you're frying the patties in a layer of oil and not in a dry pan. And yes, a small pan is better if you're making one serving, because you won't need as much oil. When the oil is hot, gently place the prepared patty in the pan. You should hear it sizzle and bubble. You can check the heat by dipping an edge of the patty in the oil, if you're not sure. Cook until the patty is browned on one side, flip and cook on the second side until it is browned. Remove the patty from the pan and let it drain for a few seconds on a paper towel to remove any excess grease. 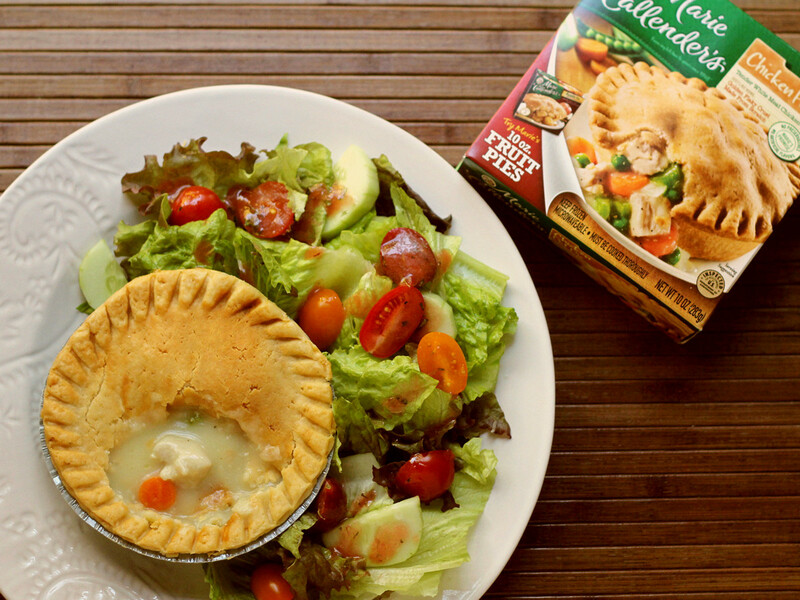 When I was a kid, pot pies were one of my favorite foods. After all, they were pies for dinner. What's not to love? And I still adore them. They're an easy dinner, and filling. And there are a whole lot of choices. 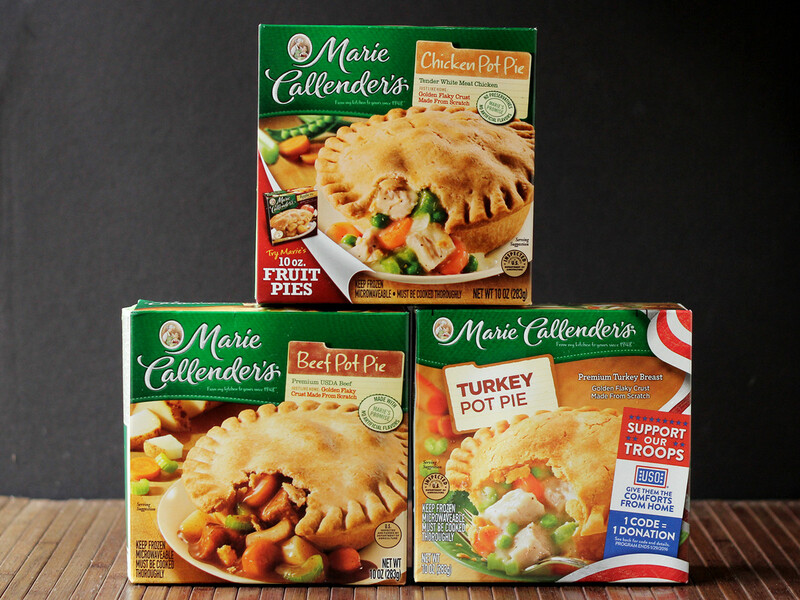 The Marie Callender's pot pies come in two sizes - 16 or 10 ounces - and there are a whole lot of flavors, along with the more traditional ones. These are pot pies just like mom used to make. Or, if I'm being totally honest, they're better than the ones mom made. 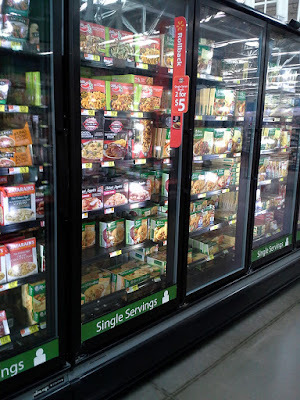 single-serving frozen section at WalMart. The choice of sizes is great, because people with small appetites can have a small pie and folks with large appetites can have a larger pie. I think a smaller pie along with a salad is a perfect meal for me. I've got the comfort food goodness of pastry with a stew-like filling, along with crisp, fresh greenness of lettuce along with the brightness of a tangy salad dressing. 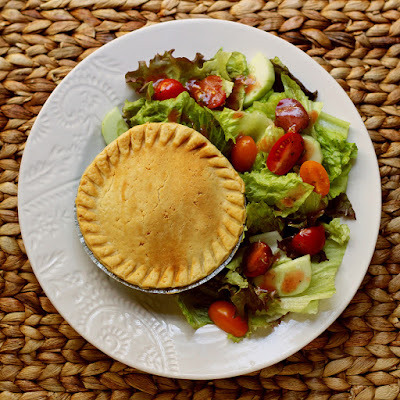 Since the pot pies can be baked in the oven or cooked in the microwave, they're great for busy nights and fun for little get-togethers around the holidays when you don't want to make a big fuss. For singles or couples, a turkey pot pie along with some cranberry sauce and other favorite sides could work for a super casual Thanksgiving for folks who don't want to deal with a month of turkey leftovers. But me, I love them for the nostalgia factor. And because they're so easy. These days, there are nights when I want to eat, but I don't want to make every little bit from scratch. To go with my pot pie, I made a vinaigrette that included jam for fruity flavor. I used a cranberry jam, but raspberry, strawberry or any other red berry would taste good and give the dressing a pretty pink color. If the color of the finished salad dressing doesn't matter, apricot or peach would make a neutral-colored dressing, or any other jam you like. Blueberry or blackberry would be interesting, right? This dressing recipe makes enough dressing for two two four salads, depending on how large your salads are, and how much dressing you like on your salad. Combine all of the ingredients (except the sugar) in a small jar with a tight-fitting lid. Shake to emulsify the dressing. Taste and add sugar if you think you need it - if your jam is very tart, you might need just a little extra sweetness. Add more salt or pepper, if desired. Refrigerate the dressing until needed. It's best if you can make this ahead of time to let the herbs hydrate in the dressing - at least an hour. Shake again before serving. Use this dressing to dress your salad just before serving. Here's more about Marie Callender's Pies - check out all the flavors! You can also follow them on Facebook. 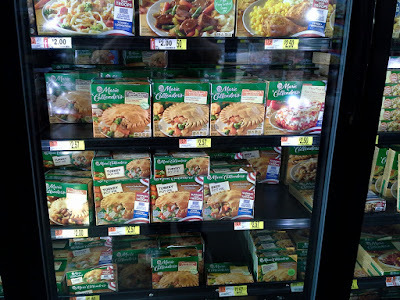 I cooked the chicken pie for this post, but I bought a selection of flavors. Because ... pot pie! With a flaky crust. It's comfort food! When the folks at Sun Basket contacted me and asked if I wanted to try their healthy meal kit service, I said "sure." Right now, I'm only cooking sporadically, so I figured that having pre-measured and pre-planned meals showing up at my door would be a good idea. All the meals at Sun Basket are categorized for different types of diets - vegetarian, paleo, gluten free, diary free, and soy free. Each week has different selections. I chose pan-roasted Pacific cod with bell pepper, artichokes, and tomato, which was gluten-free and paleo; turkey burgers with apple-date chutney and spiced rice which was gluten free; and roasted cauliflower gratin with tomato, goat cheese, and arugula, which was vegetarian and gluten free. While I liked the flavor of the rice combo, my one quibble was that I thought it would have looked better on the plate if it had been more colorful instead of having three brownish items on the plate. I added some cherry tomatoes to brighten mine up - a pretty easy fix that anyone could do. The cauliflower gratin was good, but I probably wouldn't make it the same way a second time. There was nothing wrong with it, but just not my favorite way of preparing cauliflower. I'm sure others would love it. But here's the thing. You can always change the recipes around, if you don't like some part of it. For example, the cauliflower recipe came with arugula to be made into a salad. I'm not fond of arugula, so I gave it to a friend, used some red leaf lettuce to make a salad, and made the dressing from the kit for my salad. Easy peasy. The meal kits come with a UPS return label so you can return the box and freezer packs to be re-used, so you don't have to worry about properly recycling everything. I really liked that. I'm fine with recycling cardboard, but there's no good way to recycle freezer packs. If you're looking for healthy and special-diet meal kit options, take a look at Sun Basket. All the ingredients were high quality, they were packed well, and the instructions were good. 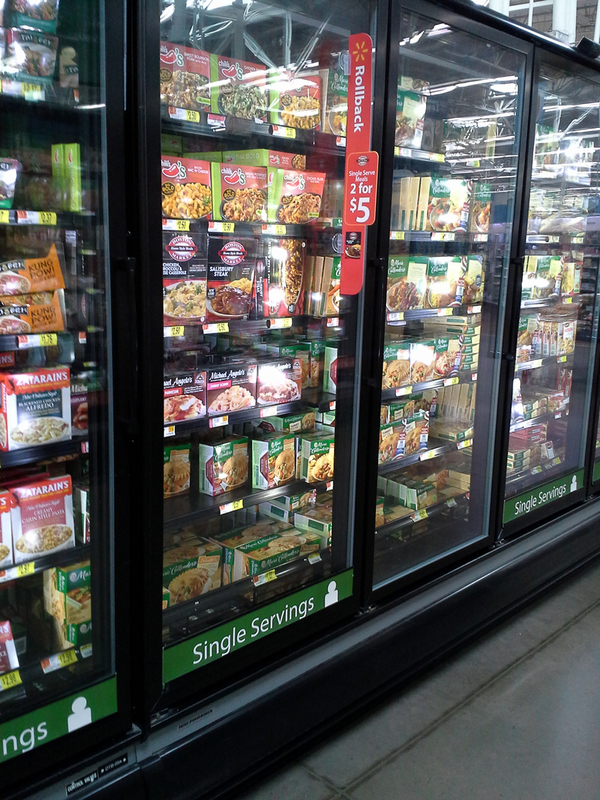 There are lots of different meal options to choose from each week, so you should be able to find something you like! If you want to give Sun Basket a try, you can get $30 off your first order just for my readers. See, I like you! And, one lucky winner can try Sun Basket for FREE. The giveaway widget is after the recipe. Pat the cod filets dry and season on both sides with salt and pepper. In a nonstick frying pan on medium heat, warm 1 or 2 tablespoons of olive oil until hot but not smoking. Cook the cod until golden brown, about 5 minutes on each side. Transfer the cod to a sheet pan and keep it warm in the oven while you prepare the rest. While the cod is cooking, you can prep the vegetables. Peel and chop the shallots. Chop the garlic. Strip the chard leaves off the stems. Rinse and chop the leaves and stems, keeping them separate. Cut the bell pepper into 1-inch pieces. Discard the seeds and stem. Rinse the artichoke hearts. Chop the oregano leaves. In the same pan used to cook the fish, add more oil if the pan seems dry. Warm over medium-high heat until hot but not smoking. Add the shallots, garlic, chard stems, bell pepper, and aleppo pepper, if you're using it. Season with salt and pepper and cook, stirring occasionally, until the shallots and chard are just tender, about 5 minutes. Stir in the tomato paste and cook until slightly caramelized, about 1 minute. Add the artichoke hearts, tomatoes, oregano, and chard leaves. Season with salt and pepper. Add 1/2 cup water and cook, stirring occasionally, until the liquid has been reduced by half, about 5 minutes longer. Transfer the braised vegetables to individual bowl. Top with the fish and serve. Sun Basket provided the meal kits to me at no cost; they also are providing the product to the winner and they also supplied the giveaway widget. Giveaway is now over. 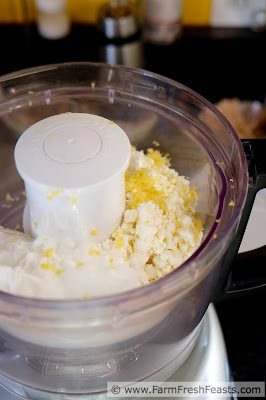 Here's one more guest post recipe from my friend Karen who blogs at Karen's Kitchen Stories. You should go check out her blog - she's got lots of fantastic stuff and her photos are lovely. Or follow her on Facebook. Go see all the great goodies she posts about! This Madras Margarita was inspired by the Madras Mimosa that is served by our favorite Sunday breakfast spot. 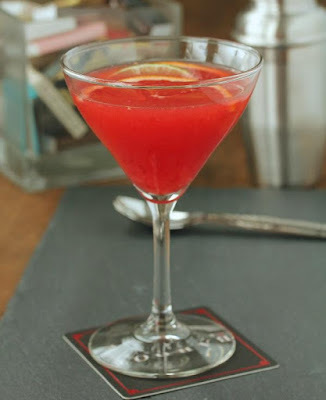 Their mimosa is mixed with orange and cranberry juice, and has a lovely pink/orange color. The restaurant sits right on the water and most of the tables are outdoors. The place is wildly popular, and people will wait up to two hours to get a table. I'm pretty sure people are willing to wait because they can buy full bottles of sparkling wine, pitchers of orange juice and cranberry juice, and stacks of plastic cups to take out onto the patio waiting area. It pretty much turns into a party. Thank goodness the leisurely breakfasts that follow are delicious and filling! There also is a madras cocktail, which consists of vodka, orange, and cranberry juice, rumored to have been invented by Smirnoff Vodka in the 1970s, and named after the preppy plaid fabric. Long story short, I thought I'd try making a madras margarita. I also added lime juice, and a bit of frozen lemonade concentrate, which i keep in the freezer. Result? This margarita is really tasty. If you don't have any lemonade concentrate, you can substitute agave, sweet and sour, or simple syrup. You can serve it on the rocks or straight up, with or without salt. In the interest of science, you really need to try all of the variations. Add all of the ingredients to an ice filled cocktail shaker and shake or stir until very cold. 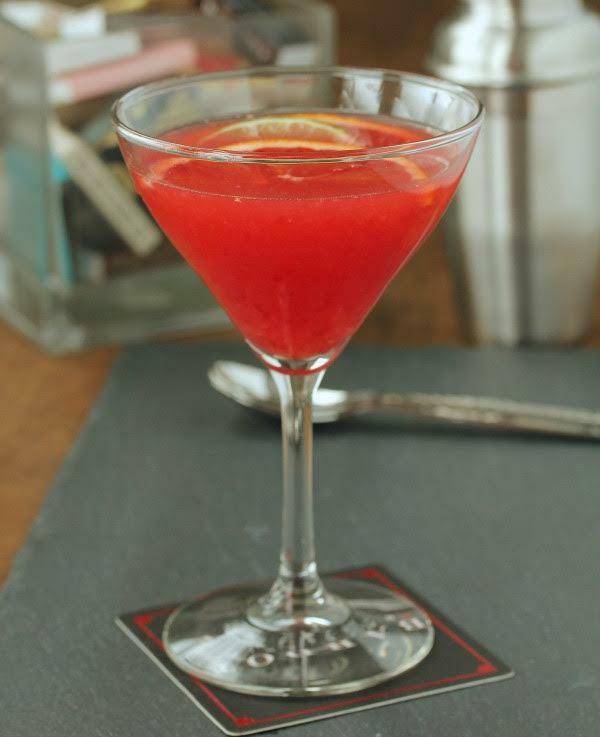 Pour into an ice filled double old fashioned glass or into a chilled martini glass. Garnish with the orange and lime slices. Soooo ... I got a box of vegetables from my friends at Frieda's Specialty Produce to have some fun with, and the one thing I'd been thinking about when I found out what was coming was the purple sweet potatoes. They're delicious and so ... purple. My first effort didn't work exactly as I planned, but I was determined to spiralize those potatoes and use them for something. Because I thought they'd look crazy fun. For my second effort, I decided to do something simple, and even more important, I wanted to make sure they wouldn't fall apart. Not everything you spiralize will turn into noodles, people. It's not magic, it's just a different way of cutting. As a side note, I used the new Kitchenaid spiralizer attachment . Which I did not get for free, so this is not a sponsored post for them. But I have to tell you about it! It's really cool! It works like the hand-crank spiralizer, but you don't have to crank, and it's mostly metal, so it's super-sturdy. It has two slicing blades - the same thickness, but different-sized cores. And then two spiralize blades for different thicknesses of the cuts. I've only used the smaller one so far. And it also has a peeler attachment, so you could use it to peel things. It worked really well to peel and slice apples all at once. So anyway, this was super-simple, but fun. The result is tasty. And ... depending on how you serve them, this could be spooky or not. Call them curly shoestring purple sweet potato fries and they're not scary at all. Call them something ... scary ... and they'd fit very appropriately on a Halloween table. I mean, imagine a nest of these potatoes with a pair of eyes (radish slice for the whites an olive half for the pupil) in the middle. Right? Right? Or arrange the spiraly potato pieces around a meatball to make a spider. Or ... I'm sure you can think of plenty of other things. Heat the oven to 375 degrees while you prep your potato(es). The oven temperature can be flexible if you've got something else in the oven that requires a precise temperature - like if you're baking a cake or a pie. 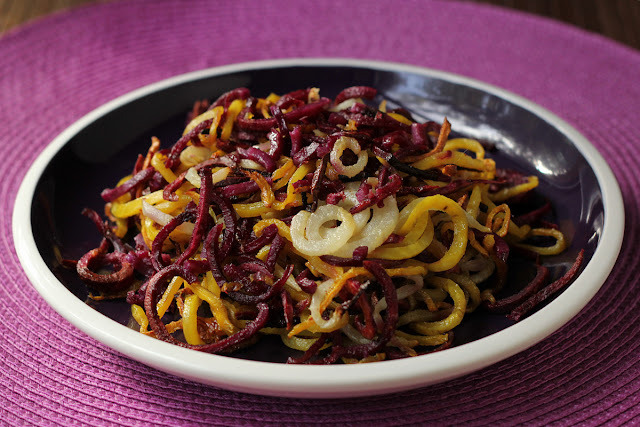 Peel and spiralize the potato using whatever spiralizer gadget you have. Place the spiralized potatoes on a baking sheet in a somewhat even arrangement. You can line the baking sheet with a silicone baking mat for easier cleanup if you like. A few bits of potato might stick, but it's not a dealbreaker if you don't use the mat. Drizzle olive oil on the potatoes. You need enough to coat them, but you needn't get carried away. Add a sprinkle of salt. Add pepper, too, if you like, or other seasonings. Bake at 375 degrees for 30-40 minutes, until the potatoes are cooked through, stirring once or twice during the cooking time to rearrange them to make sure they cook evenly. The ones at the edges of the pan will cook faster, or if you've got some super-tight spiral or they're piled on top of each other, they'll take a little longer. It's fine if some bits get a little crisp. I actually like the crisp edges and bits, but watch to make sure they don't completely dry out or they're a little tough on the teeth! I loved the purple sweet potatoes cooked this way, but decided to add more color to the plate - I added a kohlrabi and a yellow beet to another batch cooked the same way. It was an interesting mix and really good! A facebook group that I belong to recently issued a challenge for people to bake cupcakes. This isn't a blogger group, so it's not like we were supposed to blog about them. Just make cupcakes and post a photo. I thought, no, I really don't want to make a dozen or two dozen cupcakes. Just ... no. But ... I really didn't want two cupcakes. I didn't need two cupcakes. I still had a couple slices of pecan pie that a neighbor gave me, so I didn't need more desserts sitting around. On the other hand, my Facebook group is filled with friends who always have by back when I'm down. They comfort me and care about me and cheer me up. And I've certainly leaned on them a lot in the last few weeks. So, cupcakes aren't a big thing to do for people like that. I'm starting to feel a lot better (thanks for asking!) and I've started cooking and writing again. I'm getting back to work a little more regularly. I'm doing things around the house besides moping and watching TV. I still have bad days and bad hours, but I'm getting back on my feet. I know I need to move forward, and I'm doing it. I decided to cut the recipe in half and do a little adjusting for high altitude, and the cupcake was lovely. One single happy cupcake. For frosting, I used Hershey's chocolate spread , straight from the jar. Because, hey, it was exactly what I wanted. That stuff is good. If it seems silly to heat up the oven for one cupcake, well, it might be. So put this on the menu for days when you have something else in the oven. It might be possible to bake this in a countertop oven, but I really don't know. I don't have one of those. If you have one, give it a try and let me know. It's not a lot of risk ... it's just one cupcake! Combine the flour, sugar, cocoa and salt in a small bowl. Mix well, making sure you don't have lumps of cocoa or flour. Add the milk, vegetable oil, and vanilla extract, and mix until combined. Yes, it's not a lot of batter. Place the muffin cup on a baking sheet or, if you're short on space, you can put it on/in any sort of dish, ramekin, or other oven-safe container that will be easy to take out of the oven. Keep in mind that if you use something that insulates your cupcake, like a ramekin or thick baking dish, your cupcake will take a little longer to bake. Bake at 375 degrees (or 350 degrees if you're not at high altitude) until the top of the cupcake bounces back when you touch it lightly on the top, and a toothpick inserted in the center comes out clean, about 25 minutes. The original recipe said 20-22 minutes, but mine needed a few extra minutes. Check yours earlier, and baked longer if it needs it. This three ingredient savory dip is delightful with chopped vegetables or crackers. 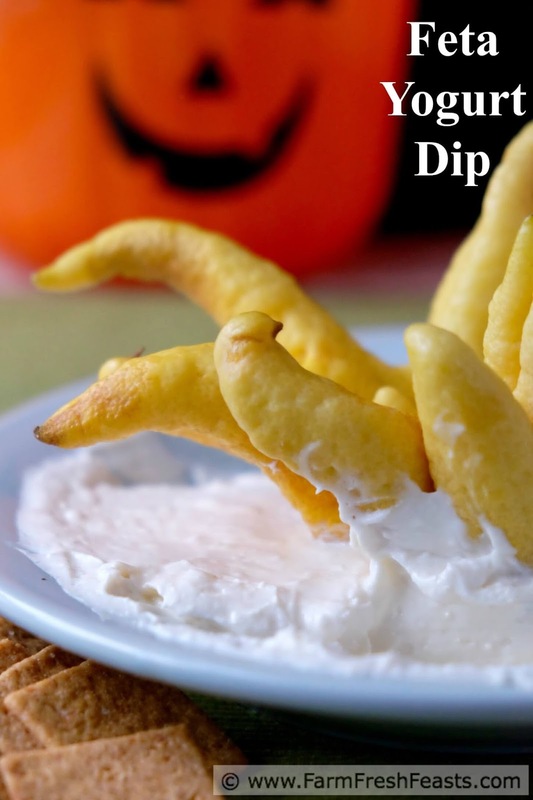 Decorate the Buddha's Hand to make it even spookier for Halloween! 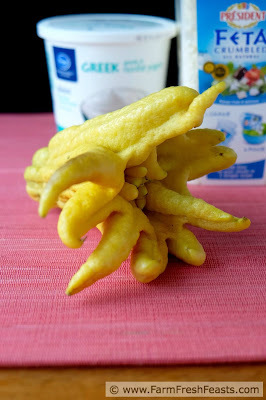 Disclosure: Melissa's Produce sent me the Buddha's Hand Citron to play with. Thanks for having me over, Donna! No no, please don't go to any bother--let me take care of you. I brought a snack to share with you and your readers today and I'll do my own introduction. Hi Donna's readers! 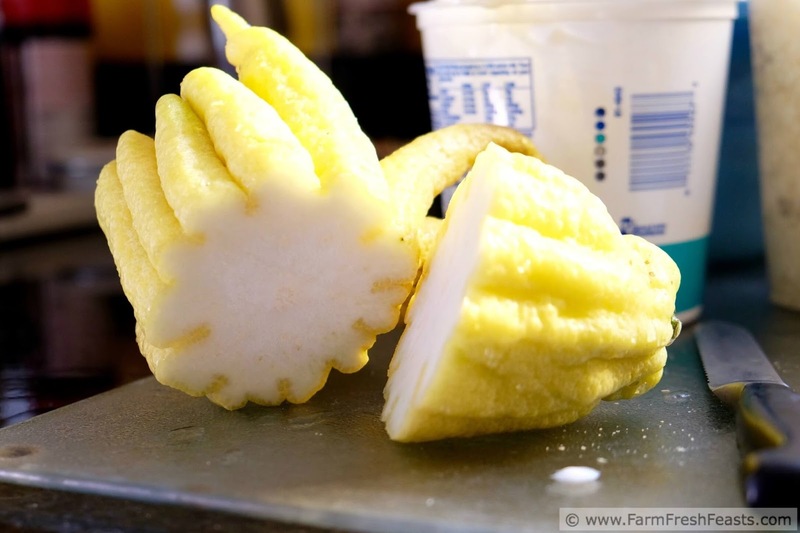 I write Farm Fresh Feasts where I provide practical support for local eating. I share recipes using ingredients from my Community Supported Agriculture (CSA) farm share, the farmer's market, my garden and volunteers from the rogue compost bins. To help other folks like me use all those local veggies, I've created a Visual Recipe Index by Ingredient--including more than 50 recipes on the Kohlrabi page alone--shared from other bloggers on the web. Stumped by farm share produce? Check it out--you're sure to find something for every eating style. While I was exploring Cookistry I found oodles of Halloween treats. From Donna's interview with Nadia G filled with spooky party treats, to her Chocolate Bats, Coffin Cookies, Cuddly Monster Chocolate Mayonnaise Cupcakes, and GingerBoo House--Donna has a bountiful spread of Halloween goodies here. I'm going to add another one! When Melissa's Produce sent me a box of #FreakyFruits last year I was amazed at the weirdness of nature and inspired in the kitchen. The Buddha's Hand citron looked like a suitably spooky item to use for an upcoming Halloween party. Since I'm always looking for more Awesome Veggie Apps and Snacks (for my Pinterest boards) I wanted a savory appetizer. I thought of the lemon feta dip that my mom discovered at my local grocery store and decided to try my own version. 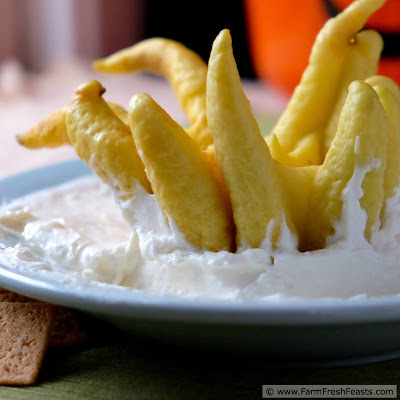 Since there are only 3 ingredients it's easy to play around and add more yogurt if you want a creamier dip, or more feta if you're looking for a saltier tang. This is a little thinner than the store's version and we like it a lot. Note: we particularly like this dip with Wheat Thins because the slightly sweet cracker is a nice combination with the tangy feta. It's also good with sliced veggies and pretzels. 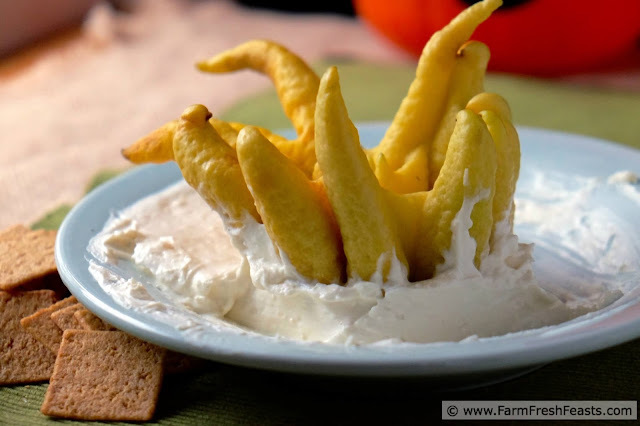 If you're planning to display the top half of the Buddha's Hand in the center of your dip, cut the citron in half and zest only the base. You'll need about 2 to 3 tablespoons of zest. Combine the zest, feta and yogurt in a food processor, pulsing until well-blended. Chill for at least 30 minutes and up to 8 hours. Taste, and see if you'd like a creamier dip (add more yogurt) or more feta. Add the upper part of the Buddha's Hand just before serving. 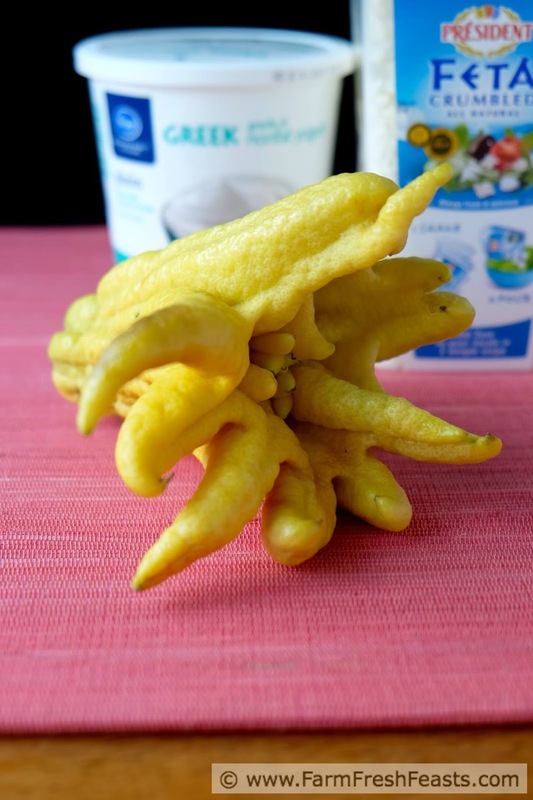 Disclosure--Melissa's Produce sent me the Buddha's Hand Citron along with a bunch of other #FreakyFruits. Hey, look, I'm back to blogging. Well, not really. 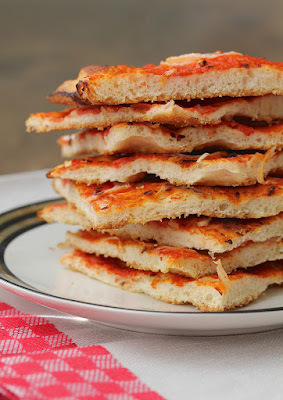 This recipe is a guest post from my friend Karen who blogs at Karen's Kitchen Stories. You should go check out her blog - she's got lots of fantastic stuff and her photos are lovely. Or follow her on Facebook. Yes, you should do that, too. 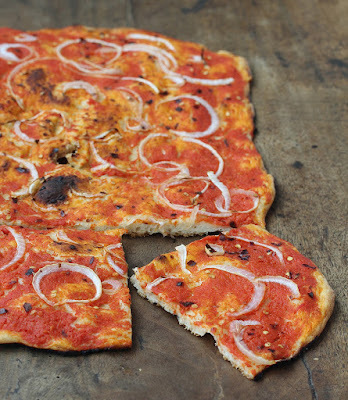 This tomato and onion flatbread is so easy to make, and is amazingly thin and crispy. When you pull it out of the oven, you can hear it crackle. 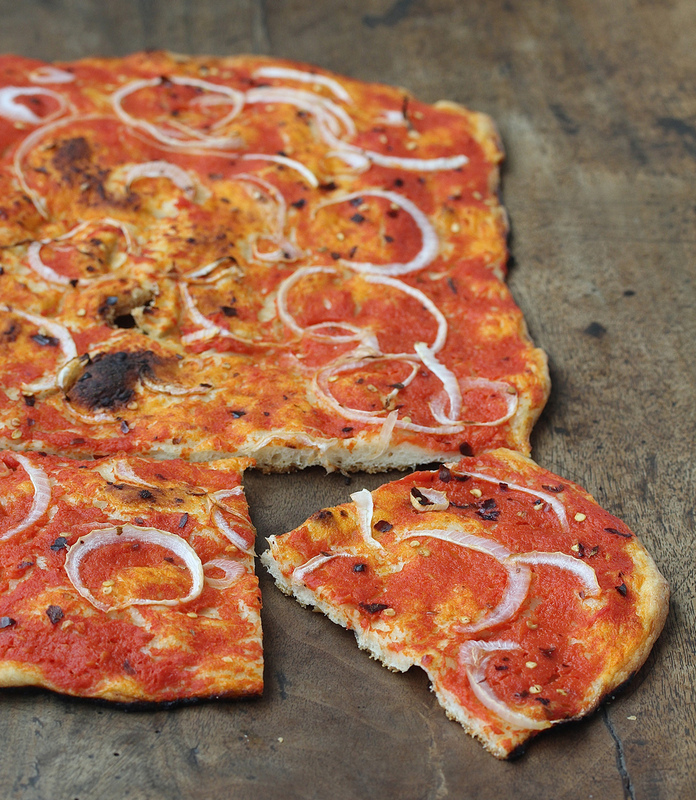 What I love about this flatbread is that you get the joy of eating pizza without all of the extra calories. 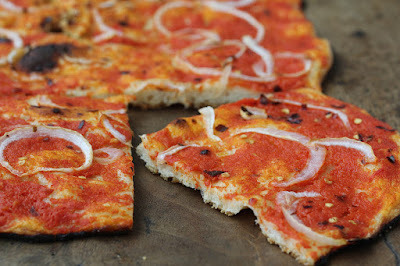 The flatbread is light and thin, and the topping is simply tomatoes and onions. Veggies! It’s almost health food, right? 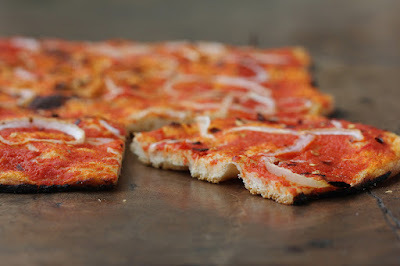 I’ve made this in advance, reheated it on a hot baking stone, and served it as an appetizer. We’ve also had leftovers for breakfast! Last night, we had it as a side to baked salmon, along with a salad. It’s really versatile. This crust is a great vehicle for lots of toppings. 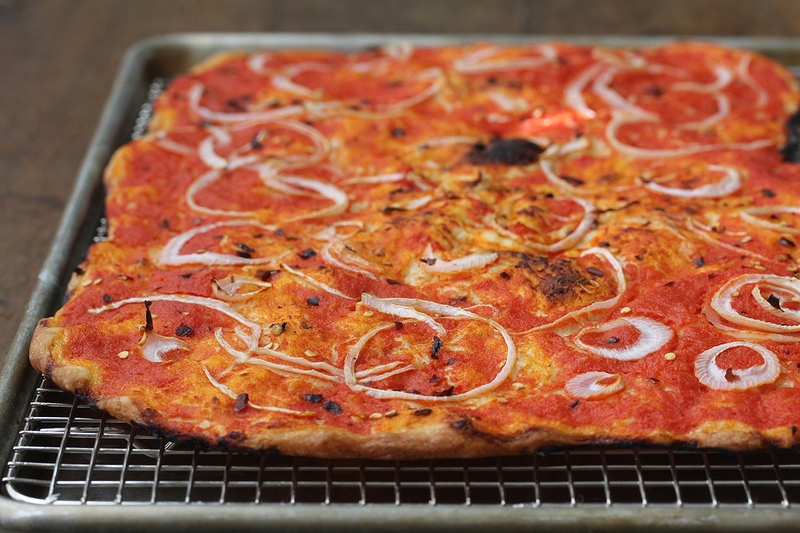 Once you get it stretched out onto the half sheet pan, you can choose any toppings you like. Honestly, I think pizza and flatbread should be its own food group. One note: Be sure to keep an eye out for any puffing up of the dough as it bakes. While I’ve made this flatbread many times, this time the flatbread rose up about 6 inches in the middle in the first five minutes of baking (eek! ), so I stabbed in in the middle with a fork to flatten it out. It worked out fine! Mix the dough ingredients in a large bowl with your hands, spoon, or dough whisk. The dough should be fairly stiff. I added an extra tablespoon of water. Cover the bowl with plastic wrap and let sit for 2 hours, until more than doubled. Preheat the oven to 500 degrees F. If you have a baking stone, place it on the middle rack. Drizzle olive oil onto a half sheet pan. Take the dough and stretch it lengthwise onto the pan. Let it relax. While it is relaxing, using a strainer, drain the diced tomatoes, reserving the liquid. Using a blender, hand blender, or food processor, mix the tomatoes, 3/4 cup of the reserved tomato juice, olive oil, and salt. Set aside. Continue to press and stretch the dough until it nearly fills the sheet pan. 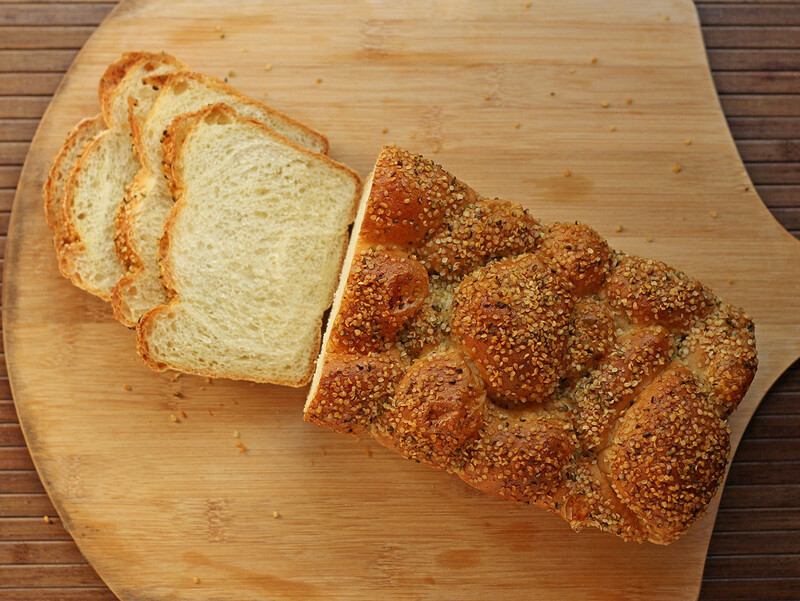 Pinch together any breaks in the dough. Ladle the tomato sauce over the entirety of the dough. Sprinkle with the onions and crushed red peppers. Bake for 25 to 30 minutes, until the edges are slightly charred. Using tongs, pull the pizza onto a cutting board.